In Stowe, Vermont, a 12-sided vacation home with lovely mountain vistas takes its cue from Shaker barns. Througout the home, oversize windows capture soaring vistas: to the west, madonna mountain, and to the east, the Worcester Mountains. AS HE DROVE HOME from work one evening along Vermont’s Route 100, Andrew Volansky noticed flames from a massive fire. The next day, when the architect arrived at his office in Stowe, he learned that the fire, started by a propane tank, had destroyed a house his firm had renovated in Sterling Valley, some 10 miles from Route 100. Fortunately, no one was harmed. “The homeowners showed up at our office the morning after the fire, wearing brand-new clothes — because they’d lost everything — and asked us to help figure out the best thing to do,” says Volansky, who works for Cushman Design Group. Ultimately, the owners decided to build a new home based on the original structure: a 12-sided form inspired by the architecture of Shaker barns. While the owners wanted to re-create the exterior and to play up the barn aesthetic inside, they also wanted the interiors to have a modern feel. And they had a budget. “In terms of spending, the homeowners wanted to put the most emphasis on the common spaces — the entry, kitchen, living, and dining areas,” Volansky says. Located on the main level, the kitchen, living, and dining areas aren’t divided by walls, yet each is a clearly defined space. Multiple columns — necessary to support the 12-sided structure — help separate the areas. “We moved some of the columns off-center along the beam line to give the rooms a sense of enclosure and to create natural circulation paths,” says Volansky. 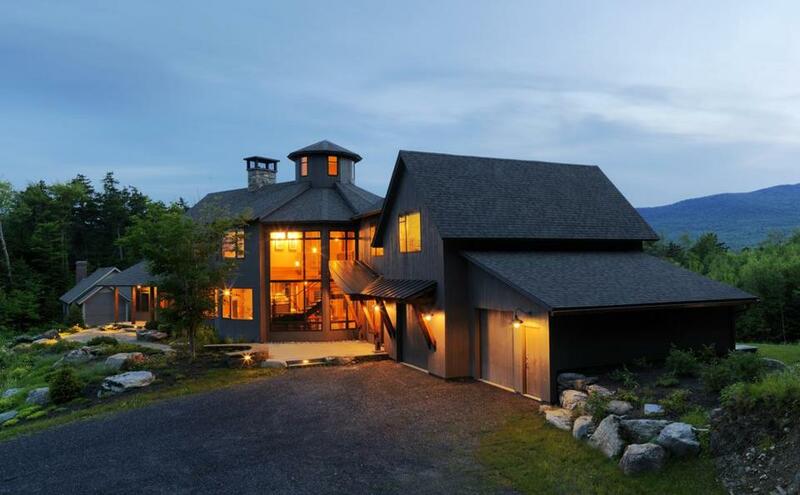 This 12-sided vacation home in Stowe, Vermont, with lovely mountain views, takes its cue from Shaker barns. Throughout the home, which was completed in 2009, oversize windows capture soaring vistas: to the west, Madonna Mountain, and to the east, the Worcester Mountains. Knotty wide-plank Eastern white pine floors enhance the structure’s barn-like essence, as do copper light fixtures that Volansky had made by California company Baselite. “The fixtures are clean and simple, made of raw copper that will patina over time,” says Volansky, who points out that they are also relatively affordable. There’s more copper in the kids’ bathroom, where a deep soaking tub made of the rosy-hued metal is a standout, along with sinks fabricated out of stainless-steel milking buckets — another play on the barn vibe. 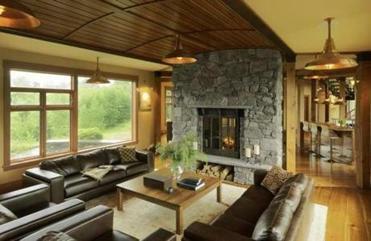 The homeowners wanted the house to incorporate natural materials — sourced locally whenever possible, such as the flagstone floor in the entryway and the fireplace’s massive fieldstone surround. The home’s stunning steel and wood staircase was crafted by area metalsmith John Bornemann.